Complex but so very satisfying! This has had very mixed reviews on Amazon which just goes to show that you have to make up your own mind about a book. I read it very quickly because I loved it. I know I missed bits – just when did Jackson lose his jacket? I’ve tried to track it down but I can’t spot it, so I’m thinking of reading it again before I have to take it back to the library. It really is a case of bad news all round. To start at the beginning – six year old Joanna witnesses the murder of her mother, older sister and baby brother. It goes from bad to worse with several interlinking plots (some with convenient coincidences) to keep me guessing what disaster would happen next.Thirty years later the killer is about to be released. Joanna, is now Dr Hunter, and has a baby and an unlikeable husband Neil. She is helped by Reggie, an extremely likeable and resourceful sixteen year old girl. When Joanna goes missing Reggie is the one who insists the police in the form of Detective Chief Inspector Louise Monroe (not very likable) investigates. Louise has her own problems in the form of a likeable husband. Then there is Jackson Brodie, formerly a police officer and private investigator, who gets involved due to being in the wrong place at the wrong time. At times the plots got so complicated that I couldn’t quite remember who did what – one problem of reading too quickly. Reggie had to leave school after the death of her mother. She is still doing her A-Levels and is tutored by her former teacher, Ms MacDonald who is suffering from cancer. Her brother Billy and his ‘friends’ threaten both Reggie and Ms MacDonald with unpleasant consequences. Then there is Alison living in dread of the return of her homicidal maniac of a husband who is on the run, a train crash, and the unexplained murder of two men in a burnt down house – etc, etc. It seems like a catalogue of disasters but it’s also funny and light at the same time and there are plenty of allusions to keep me working out where they come from. The easiest were the nursery rhymes Joanna sings to her baby and that Kate Atkinson works into the text. It’s set in Edinburgh, a place that is new to me, but as my son and family are now living nearby, of great interest and I could identify some of the locations. There is plenty of action, good characterisation and dramatisation of how relationships work – or don’t work. I’ve previously read Kate Atkinson’s Case Histories, also featuring Jackson Brodie and I thought I’d read One Good Turn, the second Jackson book – but I haven’t. It’s a toss-up now between re-reading When Will there Be Good News? and One Good Turn (which I own). I just hope no one has reserved the library book! Author MargaretPosted on February 18, 2009 August 25, 2018 Categories Book Reviews, Crime Fiction, Support Your Library Challenge 2009Tags When Will There Be Good News? I’ve seen this book everywhere, I like your review . It will be added to my tbr list. Another book blogger sent me this book. She didn’t like it, and I left a comment saying how much I enjoyed Case Histories and One Good Turn. There is something so very satisfying about Atkinson’s skill in plotting and characterization! I have this one, but haven’t read it yet. Happy to see you enjoyed it. Great review. I appreciate your sharing this. I need to read this series. 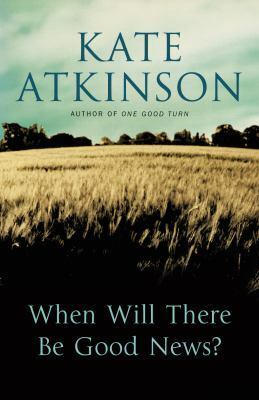 I read a Kate Atkinson book many years ago that I enjoyed. Can’t think of the name right now. I missed things. One Good Turn is as good, so I’d read that if you can get a hold of a copy. I adored this. It was on my ‘top ten’ list for 2008. This was my favorite of the series, and I hope, hope, hope, that Atkinson does another.